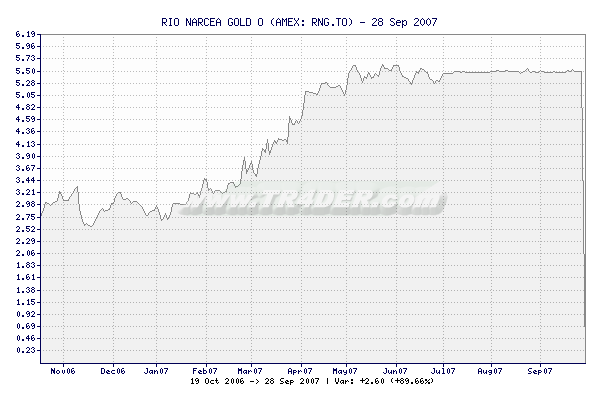 TR4DER - Put a RIO NARCEA GOLD O [RNG.TO] chart on your website! Last Minute: "Dems plan conference call Monday to debate Mueller report's implications - Fox News" Sun, 21 Apr 2019 05:17:51 GMT "Authorities refocus search of missing 5-year-old boy on family home - WLS-TV" Sun, 21 Apr 2019 04:37:41 GMT "Washington state lawmaker riles nurses by saying that some spend 'considerable' time playing cards - Fox News" Sun, 21 Apr 2019 01:15:19 GMT "Rep. Duncan Hunter posts video climbing over fake 'border wall,' opponent claims he violated bail agreement - CNN" Sat, 20 Apr 2019 00:32:00 GMT "Undersheriff: Teen's death likely preceded Colorado manhunt - The Denver Channel" Sat, 20 Apr 2019 04:00:00 GMT "Mike Huckabee slams Mitt Romney over Trump criticism: 'Makes me sick' you could have been president - AOL" Sat, 20 Apr 2019 21:57:55 GMT "Hair on fire, media declare William Barr's press conference a disgrace - Washington Examiner" Thu, 18 Apr 2019 15:13:00 GMT "Sri Lanka blasts: At least 138 dead and more than 560 injured in multiple church and hotel explosions - CNN" Sun, 21 Apr 2019 08:51:00 GMT "Man who is believed to be part of milita detaining migrants arrested on firearms charges - CBS News" Sun, 21 Apr 2019 02:51:00 GMT "Notre Dame fire pledges inflame yellow vest protesters - Al Jazeera English" Sat, 20 Apr 2019 18:29:00 GMT For more news, click here. 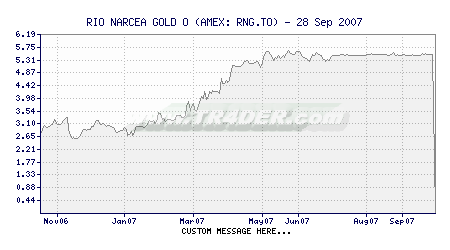 The asset is already chosen, in this case the "RIO NARCEA GOLD O [RNG.TO]", asset, if you wish to select choose another one, you should go back to the quote page, and select another asset. You should select only the width and height of the image you wish and click on "Obtain Code" to see a preview of the chart how it is at the moment with the data you have chosen. After doing that, you can put a custom text at your taste, and click again on "Obtain Code" and you'll have the final code of the chart you've made for you to put on your website.